“Experience is what you get when you don't get what you want.” It is an old and well-worn phrase, but is it true? There is a reason these debates go on and on, because frankly, what people are talking about is so vague, it staggers belief. Experience is not in itself meaningful, nor is it able to be measured in time or frequency (years or numbers). Here's why. Experience is of no use unless it has been developmental and you have learned from it. If the lesson kills you, then you were not ready to change and adapt to it. Remember, Darwin said it is not the survival of the fittest, but those most adaptable to change. It is badly, though not incompletely, related to time. For example, 20 years diving is of no use if it has all been in the same patch of ocean and/or doing the same dives. You have one year’s experience repeated 20 times. Similarly, 100 dives that are all the same and that have gone well, even as an instructor, is not 100 dives worth of experience. It is one dive’s worth of experience repeated 100 times. Being lucky and getting away with dives beyond training and experience based on ignorance or bravado is not big and not clever. We also know so much more about what works and does not these days, and training curriculums reflect the hard and, in some cases, very final lessons that some of the early pioneers taught us. So, in today’s world, experience without training is arrogant irresponsible, reckless and ignorant. Training is no use unless it has been with the right instructor, and again, has been a learning and developmental experience. Simply muddling through a tick box exercise and a series of PowerPoint presentations on diving is not being trained. Nor is being bullied and beasted by the pseudo-military wannabees. (See the article on why training with some instructors might be a waste of time). If you claim to have the training and show off all the badges but have no experience, then my first reaction is to question the quality and value of your training and to assume you are naive and impatient. So, quality training and meaningful, relevant experience need to be combined, if you want a positive character assessment from me. Not that everyone would be too bothered, I suppose, by my opinion. So, let us look at the agency-bashing exercise the guy doing deco on his couch loves. Well, using generic definitions of training and experience, you can pick a standpoint and have an easy pop at most of them. Effectively, the agencies have set themselves up to be shot at. They publish standards, both on training skills and competencies, as well as setting qualifying experiential criteria. Brave, but they are right—a line has to be drawn somewhere. But, as always, the devil is in the details. Take the example of becoming a technical instructor, for instance. One agency is happy you start with only 25 deep dives and finish with 60; another wants over 100; others, more. The lower numbers might be okay if the dives were all meaningful, learning-experience dives—but they will not be in 95 percent of cases. Past recreational dives are counted. Make sure the experience is not only meaningful but relevant. Recreational experience as an instructor is not relevant to technical teaching, even if you have been a recreational instructor for 20 years or more. Bear in mind, the largest group of deaths in cave diving is recreational instructors with no cave training or cave experience. To me, qualifying experience dives to become a technical instructor should be signed off, dive by dive, with another technical instructor, or at the very least, a technical divemaster. They should be properly logged, with what was learnt from the dive, and any incidents recorded, including how they were managed. What level can you teach? I also believe you should not be able to teach to the level at which you are a diver. You should only be able to teach one below. So, for example you would not teach normoxic trimix if you were not hypoxic qualified. In this way, the qualifying number of dives could reasonably be, say, around the 100 mark. But they can all be assessed by an instructor trainer as to how meaningful they were. If the candidate did have the same dive repeated 100 times, then off they must go to get 99 more meaningful experience dives. In this way, all divers—even if not aiming to become a technical instructor—can also get guidance and input on what training would be most meaningful for them. Technical training does follow a meaningful pathway with gradually increasing depths, gas and deco mixtures. But for some divers, the steps between each level can still be too big, depending on the level and quality of experience they have built up since their last training, and depending on the quality of that training. In recreational diving, the development is more ad hoc, with almost any agency programme. Divers jump onto specialties, like nitrox and wreck courses, before competency in the essentials of buoyancy, trim and propulsion have been mastered. So, we are now faced with a conundrum. If experience is to be meaningful, it must expose the person to a learning experience, but ideally one that does not injure or kill them. To achieve this, the diver must take responsibility for and must plan their experience acquisition to at least the same detail as they plan their training progression. They should invest in the process of gaining experience, probably to the point where they spend more time, effort and money on gaining experience than they need to invest in their training. Training courses can be anything from one to six days, typically. Between course experience in recreational diving, I would say a minimum 25 “meaningful” dives, and in technical diving, a minimum of 50 “meaningful” dives, should occur between diver level courses. This will, of course, take a lot longer than both agencies and divers themselves want, but it is, I feel, well-advised. You should also look for quality inputs into your diving, whilst the experience is being gained. How can you do this? Firstly, mentors. Whether you chose your last instructor, or ideally, you choose your next planned instructor, ask them for help and advice on the dives you should do, whom you should do them with, and what conditions you should operate in. If not an instructor, then find divers who have both your respect and the respect of their peers, as well as a reputable agency for their dive certifications. Good sense suggests that you try to regularly use more than one mentor. When you find good mentors, keep them close, and keep asking them to help you develop meaningful experiences. Secondly, teammates. Dive and dive often with people who are at a level or two above you, but are where you want to go. Watch them—from their preparation the night before to their routines, checks and preparation on the day, before and after the dive. Observe them in the water, and try to emulate what you think to be good practice. Ask them to explain different or unusual configuration choices, and talk about planned responses to the unexpected. In short, soak up their experience and training. Log what you learned and note what you want to try out next. Thirdly, variety. Within your current limits, and only at the edge of your comfort zone, get as much variety of diving as you can: warm to cold, current to calm, shore, boat and all varieties of scenic and wreck. Reflect on how you prepared for the dive and what skills, kit and configurations worked best or let you down. Reflection is the very best way of gaining meaningful experience (check out my past articles for some tips). Fourthly, get some coaching. Do not think all development has to be independent experience or formal training. Work with a good mentor or instructor and take a day’s coaching. Talk to your mentor about appropriate content. Share notes and reflections from your experience dives, so you can agree on what you will work on. It is a lot more fun than training, as there does not have to be formal assessment. Your time with a mentor can be used to explore your capabilities, not just what the training course expects to be delivered. It is usually of great value, especially for what you get out of it. Finally, it is a brilliant way of checking out potential instructors for future courses. Ask yourself: Do you enjoy their teaching style? Do you respect their approach and in-water skills? Did they improve your diving in the time you spent with them? So, is experience what you get when you do not get what you want? Well, that is certainly how it was for the pioneers of diving. Nowadays, though, it does not need to be. Relevant and meaningful experience should be what you want, and what all agencies and instructors or instructor trainers demand, before you take the next courses up the diving ladder. You can plan it so it is safe and developmental—you learn from every dive. It is the cement between the bricks of the training you take, which should definitely be of the highest quality. 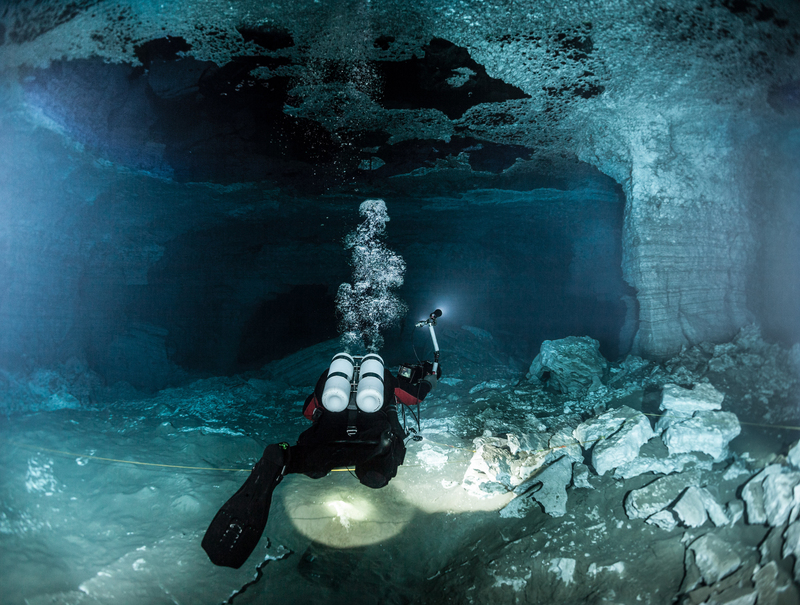 Technical trimix and cave diver, Matt Jevon, is a technical and CCR instructor with TDI, IANTD and PADI. He is also the JJ-CCR instructor and dealer for Ireland. Jevon has held accreditations as an interdisciplinary sports scientist, sports psychologist and was a British Olympic registered strength and conditioning coach.